Contact our office to book a multi-day rental. Quotes are not guaranteed without staff approval. Please note that the warehouse is only open during the appointment time. ALL pickups and drop offs must occur during these time slots. Delivery is based upon a 6-hour window around your party time. If you choose to select a window larger than 6 hours, an additional charge may be incurred. Tax exempt certificate must be filed prior to the event with our company or all applicable taxes will be added back to the event. 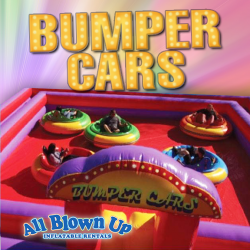 Only available from All Blown Up Inflatable Rentals, Inc., inflatable Bumper Cars are the ULTIMATE in party fun! Including an inflatable arena and 4 bumper cars, this is one extreme attraction that everyone will love! These amazing Bumper Cars move forward, backward and sideways with a 360-degree turn radius! Imagine how much fun your guests will have bumping opponents out of their way!